The Magnificent Seven Limited Edition boxed set of 7 modern Decoband pens celebrates the 90th Anniversary of the creation of the iconic Wahl and Wahl-Eversharp Oversized Gold Seal Personal point Fountain Pens. The originals, the first of the Wahl, and Wahl-Eversharp Gold Seal pens, were introduced in 1928. They were only produced for 3 years and yet they were destined to become one of the most easily recognized fountain pens from the Golden Era of writing instruments. In 2016, The Wahl-Eversharp Company revived these fine pens with the creation of the modern Oversized Decoband series to worldwide acclaim. 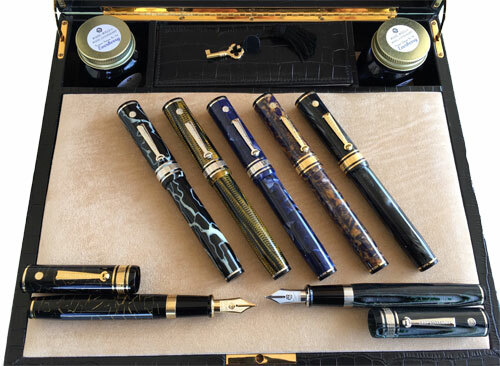 The modern Wahl-Eversharp oversized Decoband pens are the result of the collaboration of both Italian and American vision, craftsmanship, and dedication to producing the finest pens of their type available today. Nibs are revolutionary Wahl-Eversharp Superflex solid yellow 14kt gold or Rhodium Plated 14kt gold. Other metal work is heavily plated yellow 14kt on brass or Rhodium plated on brass to match the nib.